Roger Howell & Friends perform on the daytime stage of the Lunsford Festival. 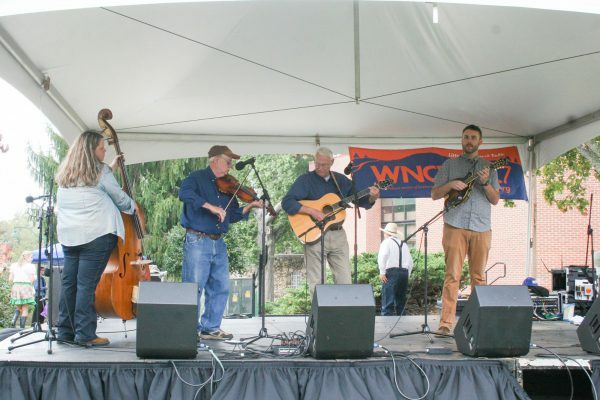 Western North Carolina’s second-oldest folk music festival returns to the Mars Hill University campus for its 51st year. The Bascom Lamar Lunsford “Minstrel of Appalachia” Festival takes place Saturday, October 6, 2018. The festival brings together some of the region’s finest musicians and dancers for a day of performances, workshops, and impromptu jams. Festival hours are 10:00 a.m. until 5:00 p.m., on the Upper Quad of the university (adjacent to College Street), with a community dance beginning at 5:30 p.m. The university campus will be buzzing that day, with the Madison County Heritage Arts Festival and the university’s homecoming celebration also happening on October 6. Admission to the main concert, open jams, ballad swap, and the community dance are free. This year, the festival also will offer three concurrent paid workshops. Roger Howell will lead a fiddle workshop, Troy Harrison will lead a banjo workshop, and Jerry Sutton will lead a guitar workshop. More information and registration for the workshops are available on the festival website. Among the performers scheduled to appear this year are the Buckner Family, Lillian Chase, Roger Howell, Joe Penland, the Old Time Ramblers, and Mars Hill University’s own Bailey Mountain Cloggers. Sixteen performers or groups are currently on the schedule, with others being added. New to the 2018 edition of the event is the Lunsford Festival Community Dance. Square, circle, and line dances will be called by renowned dancer and caller Phil Jamison. Music will be provided by Rhiannon and the Relics. The Bailey Mountain Cloggers and the Cole Mountain Cloggers will demonstrate dances and calls collected by Bascom Lamar Lunsford. Lunsford dedicated his life to traveling the Appalachian Mountains to find, memorize, and record the songs and dances so intimately woven into the mountain culture. He started the Mountain Dance and Folk Festival in Asheville in 1928, and from there was enlisted to help start the National Folk Festival. He became instrumental in the creation of multiple festivals throughout the United States, but it wasn’t until Mars Hill pharmacist Ed Howard formulated a plan to name a festival in honor of Lunsford that he ever let one of his festivals carry his name. It was only with persistence and flexibility that Howard was able to convince Lunsford to allow the festival in his hometown of Mars Hill to be named the Bascom Lamar Lunsford “Minstrel of Appalachia” Festival, and then only with the clear understanding the festival would be dedicated to authentic mountain music and dance. For updates and information, visit the festival website or contact festival director Leila Weinstein at (828) 689-1115 or lweinstein@mhu.edu.